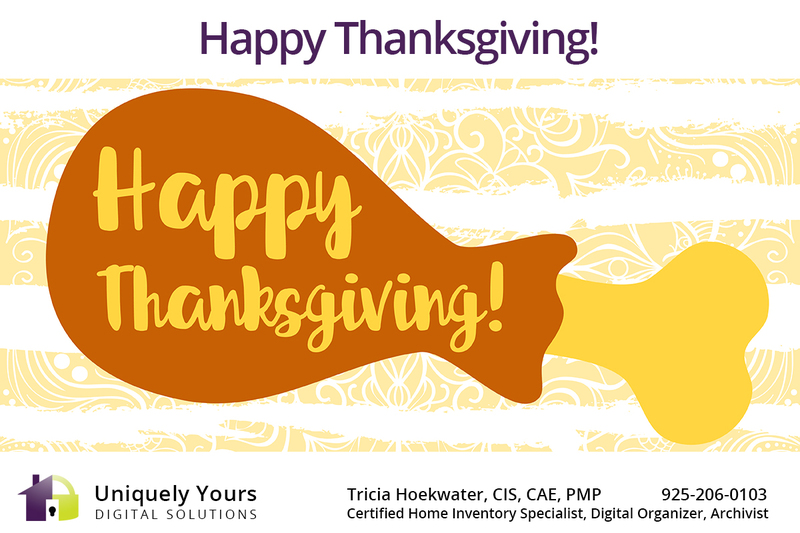 THANKSGIVING: Thanksgiving Day is a national holiday in the United States, and Thanksgiving 2018 occurs on Thursday, November 22. In 1621, the Plymouth colonists and Wampanoag Indians shared an autumn harvest feast that is acknowledged today as one of the first Thanksgiving celebrations in the colonies. For more than two centuries, days of thanksgiving were celebrated by individual colonies and states. It wasn’t until 1863, in the midst of the Civil War, that President Abraham Lincoln proclaimed a national Thanksgiving Day to be held each November. Go Paperless with Your Digital Legacy! A Digital Legacy is your virtual, secure, safe deposit box. It contains your key information, wishes and life documents in a centralized online portal. This is your tool for managing all your life documents, leaving your legacy organized for your heirs. Contact Tricia via phone at 925-206-0103 or by email: uniquelyyours@outlook.com. She can help you create your digital legacy now.